Seems my love of finding new uses for old items has extended to the garden. Or at least my love of all things free. Recently Adam and I were watching the Today show, and chef Rick Bayless was a guest. He was talking about the Sowing Millions Project that he’s involved in with the company Seeds of Change. 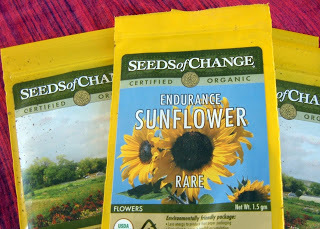 They committed to giving away 100 million seeds (you just pay the shipping). Give away? Free, you say? Well, gee, I’ll try anything if it’s free. So I went to the website, signed up for my free seeds, and promptly forgot all about it. About six weeks later, after we moved into our new place, a big, unmarked manila envelope addressed to me showed up on my doorstep. I love getting packages in the mail, and the best part is when I don’t expect them, so the giddy anticipation of finding out what was inside was delicious. I carefully opened the package to find…dozens of packets of seeds, of course! There were sunflowers and corn (LOTS of corn) and eggplant and different kinds of radishes and lots of different kinds of lettuce and beets and on and on and on. I have little (okay, no) experience with vegetable gardening, and my backyard is mostly cement, but I’m proud to say I’ve done quite a bit of container gardening in the last few days and I also dug up the soil next to our fence and planted two rows of corn and two rows of sunflowers. The daily excitement of watering them and seeing how much they’ve grown since the day before makes me feel like a little kid. I can’t wait til they’re all growed up! Pictures to come when there’s something a little more exciting to show you than just soil. Me: You wanna get some free palm trees and free aloe vera plants? Adam: Oh, you mean now? So at 10pm we hopped in the car, basically in our pajamas (amateurs!) and drove to this house which wasn’t too far from ours. However, the street had no lights, and my flashlight didn’t work, nor did we bring gloves or wear appropriae shoes (I had on flip flops – amateur!). So hoisting a 5 foot tall, 100 pound palm tree covered in sharp spikes into the trunk of my car was amusing to say the least. We made so much noise the owners came outside, although they were cool and informed us that one of the palm trees in their yard was in the movie The Ten Commandments. Even trees in Hollywood get their 15 minutes, I guess. They watched as we struggled with the palm. Okay, we watched as Adam struggled with the palm, and I nonchalantly picked which of the 30 or so aloe cuttings I wanted. Adam finallygot the palm in the trunk – incidentally, most of it sticking out the back end, and we gingerly and laughingly made our way home. Okay, maybe I was the only one laughing. 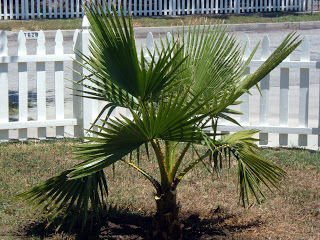 Our plan is to plant the palm in a big pot, so we can take it with us wen we eventually leave, but Adam thought we needed to plant it somewhere right away so it didn’t die. So at 11pm we were in our front yard digging a big hole to put the body, I mean plam tree, in. It’ll be a little embarrassing when the gardener comes by (again, amateurs! ), but so far it’s hanging in there. 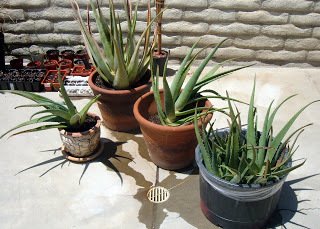 Some of the aloe have made it into planters, but many are hanging out in a pot full of water at the moment. Of course, the pots either came from garage sales ($2) or from the neighbor’s trash (free!). Did I mention I love free stuff? Previous PostLayers of TastyNext PostHere Figgy, Figgy!